Knock out dirt with the power of plants - no elbow grease required. All core products are Cradle to Cradle certified, and more than 75% meet gold level certification. This means a team of scientists at C2C Institute have rigorously assessed all ingredients, packaging materials and design, processes, making sure that we'’ve designed for maximum material reutilization. Big bottle 12 oz - made of 100% recycled plastic and easily recyclable. This is the best granite cleaner I have used and I have tried many with very disappointing results. 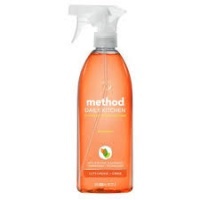 This cleaner is a pleasure to use a quick spray and wipe to a streak free shine every time.. It also has a lovely apple smell. Would highly recommend.